Welcome to the 2018 Wild Bill Hickok Rodeo the “Kimzey’s Tricked Out riders featuring Dusta Lee Kimzey and Sadie Lynn. Dusta Lee Kimzey grew up as a cowgirl. As the 6th generation on their family ranch in Oklahoma, she’s a hand with a horse and got started in the movie business thanks to her skills as a trick-rider in the Professional Rodeo Cowboys Association. She also competes at professional rodeos as a barrel racer. Her fearless nature runs in the family as her dad, Ted Kimzey is a many time Wrangler National Finals Rodeo Bullfighter Barrelman, middle brother Sage is a World Champion Bullrider, and littlest brother, Trey, does both the trick-riding and bullriding. Dusta spent her young life in the rodeo arena and it landed her a scholarship to Southwestern Oklahoma State University where she obtained a Doctorate in Pharmacy while rodeoing full time. 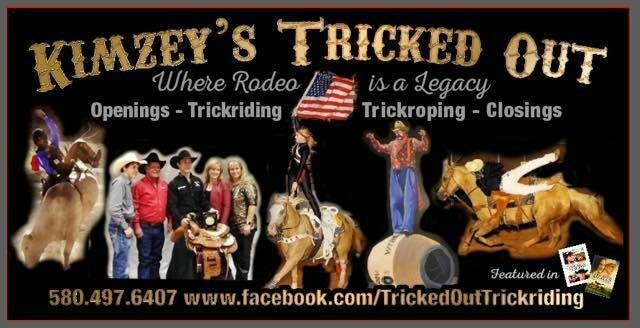 Her passion for the sport of rodeo and dare-devil stunts please crowds nationwide as she performs coast to coast at rodeos and wild west shows. Sadie Lynn is from Weatherford, Texas where she has a very incredible and somewhat hectic cowgirl lifestyle. She is the daughter of Trish Lynn, who is the founder of “The All American Cowgirl Chicks,” which is a worldwide prestigious women’s trick riding team. Sadie has been tricking riding from the start and she was actually the first Cowgirl Chick to introduce Roman riding into their act. She has a passionate love for horses, and it is shown in her dedication and talent she displays while performing. Not only is she resilient in the rodeo arena, but also in life. She was diagnosed with a very rare breast cancer at the age of l8, and continues to promote Breast Cancer Awareness and be an inspiration to cowgirls all over this country.